When I got I my trial N900 from WOMWorld I immediately checked to see if bookmarks worked with the MicroB browser – and they do. In fact, MicroB makes adding and using bookmarklets easier than any other mobile browser I’ve used. Firefox Mobile supports bookmarklets too, although not as conveniently. Find a bookmarklet you want to try. There are hundreds, maybe thousands posted on the web. A good place to start is Jesse’s Bookmarklets Site, a well organized listing of hundreds of bookmarklets. If you are looking for bookmarklet that works with a particular service, Googling for “Service Name bookmarklet” will usually find something usable. 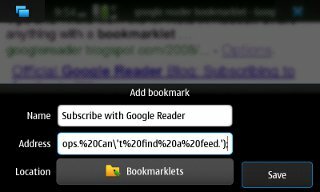 Here’s one I found searching for “Google Reader bookmarklet“, It’s a Subscribe With Google Reader bookmarklet from the Official Google Reader Blog. Once you find a bookmarklet that you want to try, do the following (you can test the process with the Google Reader bookmarklet above). Press Ctrl-D and choose “Add to bookmarks”. Tap the Address field on the add bookmarklet dialog (image right) and press Ctrl-A to highlight it. Press Ctrl-V to paste the copied bookmarklet URI into the address field. Edit the bookmarklet title and change the folder if desired and then tap the Save button. Visit the page you want the bookmarklet t0 work with. 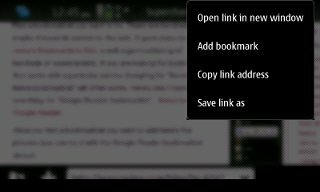 In this example, I open the site I want to add to Googe Reader, OpenAttitude.com, an interesting blog covering open source, unlocked phones, fair use and other things that make our gadgets and our lives better. Tap the bookmarklet. Depending on what the bookmarklet is supposed to do, something should happen. In this case Google Reader will load displaying the feed (image below) and where you can subscribe by tapping the “Subscribe” button. Visit o.Yeswap.com with Firefox Mobile and tap on any of the bookmarklet links. When the page reloads, slide your finger to the right revealing a hidden menu. Tap the star icon on the menu to bookmark the page. Tap the star again and choose “Edit“. On the bookmark edit dialog, change the bookmark’s title to something meaningful. Press Ctrl-L to open the “Awesome Bar“. Tap the bookmarklet you want to use. Post to Del.icio.us Add the current page to delicious.com. Add to Bloglines Add the current page’s feeds to your Blogline‘s subscriptions. Twitthat Tweet a link and include a canned or custom comment using the Twitthat service. Google Translate Translate the current page to English. All of the above work in MicroB. I don’t use Firefox Mobile much (here’s why) and only the tested the Delicious bookmarklet with it, but the others are likely to work. 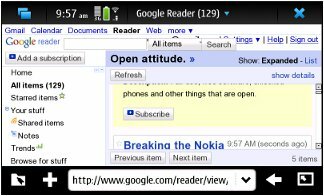 If you don’t have an N900, several other mobile browsers support bookmarkletsincluding Opera Mobile and Mini, Mobile Internet Explorer, Palm OS Blazer and the Nokia Browser on the E72, N86 and all Symbian 5th edition phones. The Android, Bolt and UCWEB browsers and all the embeded feature phone browsers I’ve tried do not, unfortuanately. See Bookmarklets for Opera Mini for more about bookmarklets. This entry was posted in Browsers and tagged bookmarklets, Firefox Mobile, Maemo, MicroB, N900 by Dennis Bournique. Bookmark the permalink. Thanks! This is an excellent addition to N900 browsing experience! Now I am able to bookmark everything to Google Bookmarks. I think an easier way is not to copy links, but simply click “Add Bookmark” on the context menu. This works in MicroB as well as Firefox.